Pieces or strands of color generally lighter than your own hair. Highlights can be made using foil or balayage/surface painting. This method is used when selected pieces or sections of the hair get lightened, while the rest is left uncovered. Strands spaced throughout all of your hair, normally what you have the first time you try this type of coloring. If your hair is long or hair cut suits you may not need a “full head” every time. This costs slightly less and strands are placed everywhere except the nape area. Same as highlights but darker than your own color or made using tints rather than lightener. (Color that grows out) The most basic and commonly referred to as a single-process color. It’s a type of color – permanent, semi-permanent or demi-permanent – that is applied to the head to create a new base color. You can achieve a variety of shades with our various products from Bumble & Bumble to Redken shades in Alexandria, VA.
(Color that fades out) This color will change the reflect of your hair or darken it but not lighten it. This color lasts approximately 6-8 weeks and can cover up to 70% grey. A type of color generally applied over highlights to give your hair a “reflect” of ash, honey, beige, champagne, etc. Great if your highlights get a bit dull you can get a toner to refresh them. Color that is applied from roots to ends. Retouch includes coloring of the regrowth from a previous color service. This is a single-process hair color service, and is ideal to cover up to 1-2 inches of hair regrowth. The color is applied on the part and around the face. This is when you need a quick set of highlights or an emergency color retouch between a full head or partial head. The strands are placed as the name suggests. 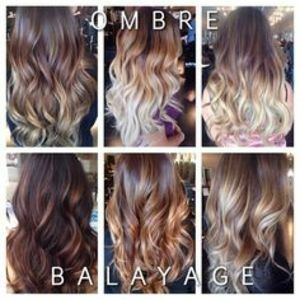 Ombre and bayalage are similar but not the same. Ombre means “shadow” and refers to the transition of a lighter shade from a darker shade. Meanwhile, bayalage refers to the French word “sweep” which is in regard to the technique of the application process; it is a more natural style with dark pieces left underneath in order to achieve a more sun-kissed look with less maintenance than an ombre. Are you dying for a professionally crafted bayalage in Alexandria, VA? Make an appointment!